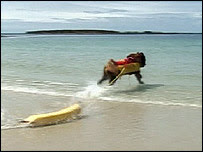 Bilbo the surf rescue dog?! he's so cool, i wish we had one at Bantham. p.s -am i the only one who bloggs on here? DDOY2a The best blog you have! No more lost lids, Eliminate clutter, and bring order to the chaos of food containers! Sign up, be among the first to know when Stacker ware launches and be eligible for a limited number of early-bird discounts! Also, enter today for a chance to win a $100 gift card from ORGANIZE.com.